Answer: Yes and no. 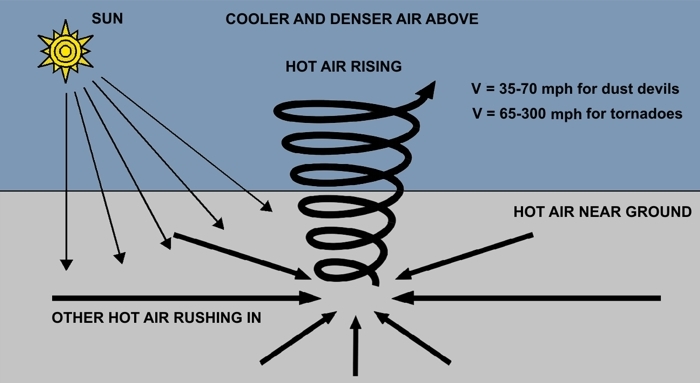 Dust devils and tornadoes are both rising spirals of air, but their speeds, sizes, and causes differ. Dust devils form when hot air near the ground breaks suddenly through an overlying layer of cooler air. This explains their preference for desert climates, where the ground is often hotter than the air above it. But you can see them pretty much anywhere the ground is hot and dusty. We all learned in school how “hot air rises,” but that’s not true in all cases. If it’s not too windy, warm air can be trapped under cooler, denser air. This is a highly unstable condition, and the layers of air will almost always overturn, often forming a beautiful spiral pattern much like water going down a drain (only upside down). Dust devils are typically 5-10 feet wide and 30 feet tall, but can reach 50×3000 feet in size. They’re mostly harmless, and only visible when they lift dust or debris. Invisible dust devils can form over grass or clean concrete. Dust Devils were known as “chiindii” to the Navajo, and were believed to be visiting tribal spirits. Tornadoes are much more violent, and normally caused by large frontal air masses moving over each other. Tornadoes usually form horizontally, then tilt groundward, which is where they frequently cause considerable damage.